Hero Awards – recognising our fundraising heroes! On Thursday 23rd March 2017 Pharmacist Support held a special event to present their Hero Awards. The event, set in the prestigious Apothecaries Hall – a building steeped in history and with a strong connection to pharmacy – was established to recognise the efforts of, and support provided to the charity by many individuals and organisations across the profession in its 175th anniversary year. In 2016 Pharmacist Support saw interactions via its social media pages increase dramatically. This was helped by the thousands of followers who liked, responded to and shared charity posts. 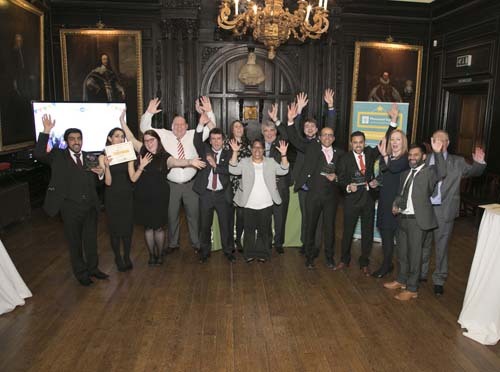 But one person in particular stuck out from the pack and the charity was delighted when last year he decided to formalise his championing activities by becoming one of the first Pharmacist Support Ambassadors. Since his initial contact some 4 years ago, Babir has raised nearly £4,000 through the sale of his book Pills, Thrills & Methadone Spills and exclusive one of a kind Mr Dispenser GoGreen4PS pens, whilst also actively championing the charity through his many roles – as Weldricks Teacher Practitioner at the University of Bradford, Pre-registration Lead for Sheffield, Rotherham and Barnsley RPS Local Practice Forum and moreover in the online world where Babir utilises his strong social media following to ensure that the profession know where to go for support in times of need. Michael is often seen out and about across the country in his green wig and T-shirt, championing the work of Pharmacist Support as an ambassador. Over the past year he has run both the Liverpool and Birmingham half marathons, delivered presentations on the charity’s work, hosted numerous information stands, taken to the stage at the RPS Awards to present in his GoGreen4PS wig and even sacrificed himself for a sponsored chest wax (at the BPSA Conference in Cardiff last year). Michael is Champion by name and now also by title as the recipient of the Pharmacist Support Charity Champion award. Boots truly got behind the charity’s wellbeing work, hosting workshops for all 400 of their pre-registration trainees, commissioning a bespoke wellbeing training video and support materials for all 8,000 of their pharmacy staff, encouraging staff fundraisers and raising an impressive £2013 for the charity in 2016. Boots, Chief Pharmacist, Marc Donovan, even tackled an inflatable 5K Gung Ho obstacle course himself to raise funds! September 25th 2016 saw the charity launch its first ever annual fundraising initiative asking people across the profession to Go Green for Pharmacist Support. The event saw teams eating green food, wearing green, drinking green tea, baking green cakes, travelling green and holding green themed meetings. BUT the Greenest of the Green GoGreeners was The Royal Pharmaceutical Society. This organisation embraced the theme, greened up their Annual Conference, held a raffle at their Awards Dinner, organised a green bake sale and took to Twitter in their stylish green wigs, raising lots of awareness of the charity in addition to a magnificent £1,376 too. The BPSA as a group really embraced the 175 Hero theme. At their Annual Conference last year in Cardiff, they hosted a charity auction where they auctioned off a 133 year old copy of the PJ, they bejewelled objects for cash, hosted charity information stands and wellbeing workshops and joined the charity’s Manchester Santa 5K run raising a fantastic £2500. In 2016 the charity connected with Pharmacy schools across Great Britain and received a fantastic response. But there was one university in particular – Robert Gordon University in Aberdeen – that raised the most funds from their 175 and GoGreen St Patricks Day pub crawl activities. Jonathan set himself an ambitious Hero challenge to raise his funds. As a non-runner he pledged to run 5k every day in January and increased this to 10K a day for the final few days of the month. In the end Jonathan raised a staggering £1,806 for Pharmacist Support. Alan has for years, quietly and without fanfare, organised numerous events to raise money for the charity. Alan is a keen wine connoisseur and last year attained the Wine & Spirit Education Trust Diploma. He has used his wine skills to host a number of wine tasting evenings for colleagues from the Gogledd Cymru North LPF, and other groups in Wales. His consistent efforts have raised in excess of £2,000,and his events have become legendary in North Wales. Known to many as the King of the pharma selfie, thanks in part to his now infamous extendable arm, Mohammed helped the charity launch its 175 Hero recruitment campaign and secure the highly successful SuperHero Selfie Station at the 2015 Pharmacy Show. Following much deliberation Mohammed decided that his personal fundraising challenge would be the Bradford Half Marathon. The result of his non-runner, running challenge was that Mohammed individually raised the most money in the charity’s 175th anniversary year. Like everyone, the charity was saddened by the news of Kirits premature passing last year, and wanted to acknowledge the significant role he played in supporting our work. Kirit made his first valuable contribution to the charity back in 2011 and since that time took part in an epic fundraising journey across 17 countries with 3 friends, committed with his fellow travellers to a £10,000 donation and in honour of the 175th anniversary year launched the charity’s first employer partnership and payroll giving scheme for employees of Day Lewis Pharmacies. As an added anniversary incentive he personally committed to match all donations made by employees in 2016. The evening’s festivities were made possible thanks to the support of lead event sponsors Weldricks Pharmacy and Durbin & The Morgan Charitable Foundation, drinks reception sponsors Numark and Real World Analytics and media partner Communications International Group. For a photo round up of the evenings festivities, click here.